Writers just wanna have fun: Literary therapy in action! Over a three-year period Karen Masman Bedford ran a series of creative writing workshops with ‘Forgotten Australians’ in Melbourne and Bendigo. The term ‘Forgotten Australians’ refers to people whose childhoods were spent in orphanages and children’s homes. Many suffered abuse of every conceivable kind. On 16 November 2009, the Prime Minister, Kevin Rudd, made an apology on behalf of all Australians. He said: ‘We recognise the pain you have suffered. Pain is so personal. So let us, together as a nation, allow this apology to begin healing this pain.’ Organisations such as Open Place in Richmond, Melbourne (who sponsored the creative writing programs) were established to offer support services to Forgotten Australians. The long work of healing the pain is far from over. During the six-week creative writing courses, we played. We did not set out to write our childhood stories or create literature or even write well. We set out to celebrate the spirit of creativity that is inherently healing and exists in everyone, whether they are highly educated or have barely made it past Grade Two. We placed aside our ideas about writing and pre-conceptions about our ability or lack of it. We didn’t worry about grammar, spelling, writing between the lines, or whether we had ever written anything before. We decided that nobody could get it wrong. We certainly didn’t try to fill up the page. One sentence or even a few words on a scrappy bit of paper were enough because even though we didn’t set out to write our life stories, we found that even a single word tells a story about something the writer has noticed. During the sessions we experimented with a smorgasbord of writing techniques including 6-word stories, 3-line poems, sentence starters, lists, hot topics, cartoon characters, photographs, symbols and character profiles. We tried automatic writing, collaborative story-writing, unsent letters and word collages. Even a rat puppet wearing a rucksack made a surprise appearance and had one participants nearly running for the door. We used many of the card sets published by Innovative Resources as prompts for writing, and we delighted and astonished ourselves with what emerged. We began by agreeing on the ground rules which included listening respectfully and generously to each other, and understanding the excruciating vulnerability even very experienced writers feel when sharing their writing. In the middle of the table we placed a leather box called ‘The Treasure Trove’. People were invited to place their snippets of writing into this box knowing that someday they might find their way into print. We sometimes roared with laughter at what someone had written and we were repeatedly moved by the poignancy and power of many pieces. ‘You’ve just got to put that in!’ we’d say. 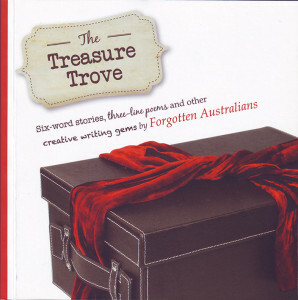 After three years the dream of publication became a reality and, with funding made available through Open Place, a book called The Treasure Trove was published. It was fittingly launched on the Anniversary of the Apology and went almost immediately into the second print run. The exquisite page designs and illustrations by Frida Shoo and Step Forbes from GreenGraphics of Castlemaine, Victoria, brought the pieces of writing to life in all kinds of unexpected ways. 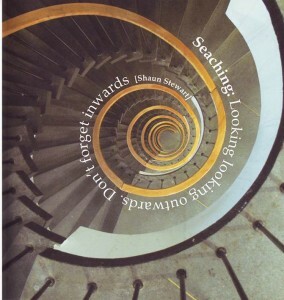 They suddenly became visible for what they always were: genuinely unique, soulful, funny, biting, playful, aching or whimsical pieces of authentic writing. And the Forgotten Australians who contributed became what many people yearn to become yet never achieve—published authors. Karen Bedford, together with Andrew Shirres, facilitates a two-day workshop called ‘The Literary Therapist’ at Buda Historic House in Castlemaine. The workshop is for anyone interested in using creative writing in their work and includes tips for designing and running a therapeutic creative writing program.